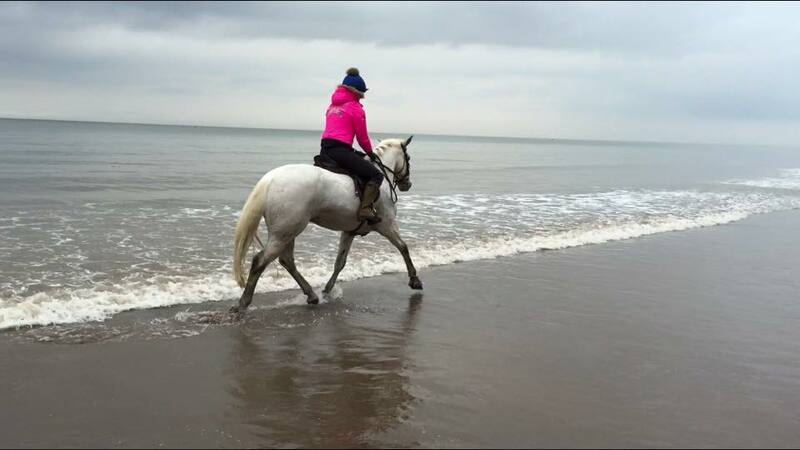 I have just returned from my last ride of 2015 and had a truly exhilarating time, giggling as we galloped across muddy fields in beautiful sunshine, I can only wish 2016 will bring as much happiness with my best friend Oscar pony. Thank you if you've taken the time to read Gee Gee and Me, writing is my indoor hobby and I have had some superb horsey Christmas gifts I can't wait to try out and share with you to keep the smiles on our faces through the long and dark January ahead! Although it is a proven fact Unicorns don't sweat, they glow...glowing can have similar adverse effects, such as overheating or becoming chilled when waiting to dry in cold weather and therefore clipping of Winter coats should be considered. 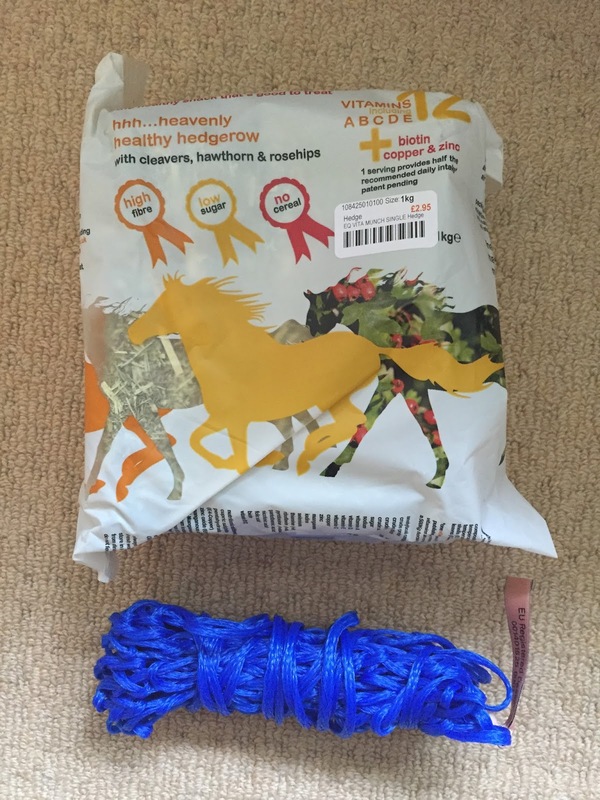 The benefits of this are for a quicker drying horse after exercise, being washed off or bathed, also making grooming easier, a more comfortable horse when being exercised, whilst ensuring condition is maintained and not lost through excessive sweating....sorry, glowing! And although I would never clip a horse for this sole reason, it maintains a smart appearance. Every horse is different and there are many traditional clips to choose from dependant on your circumstances, things to consider to help you decide are; type of horse - how much do they "glow", do they feel the cold, what level of work is your horse currently in and is this likely to alter as Winter sets in, is your horse stabled, can you commit to effective rug management - and do you have enough rugs for the changing weather are just a few key questions to ask yourself? 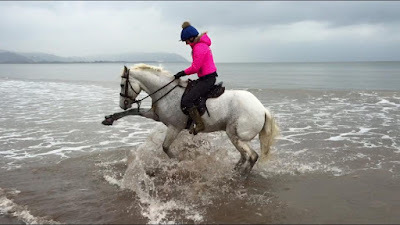 At the beginning of my first Winter with Oscar, we started out with an Irish clip, my view was I could take more off but couldn't stick it back on! As time has gone on, Oscar's wardrobe has grown (considerably) and we've learnt more about one another, I now choose a Hunter clip. Oscar is a busy bee in Autumn, I don't want him to catch a chill and it means I can hot cloth sweat off and shampoo his mane weekly without facing a dilemma of how to get him dry....hair-dryer, anyone? I have been asked on more than one occasion if I have white mud, I'm afraid not, keeping a grey horse sparkling takes commitment and hard work! Here is Oscar looking grubby prior to his clip last week, I always mark out his clip pattern using chalk and measure the length of my lines using a snipped piece of bailer twine and tie his mane and tail in rough plaits to keep them out of the way! The first time I clipped Oscar's face I lost him, he slipped out of his head collar in the blink of an eye and ran for the hills...for the remaining season kept his face tidy using my Wolseley Skylark Trimmer - my saviour! Three years later Oscar has a clean shaven face, ears included, that he stands completely still for me to clip, without a head collar in sight...a process that has taken equal amounts of time and apple cuttings. The beginning of November could have easily been mistaken for Springtime here in the UK, we basked in beautiful sunshine and there was a warmth to the air. 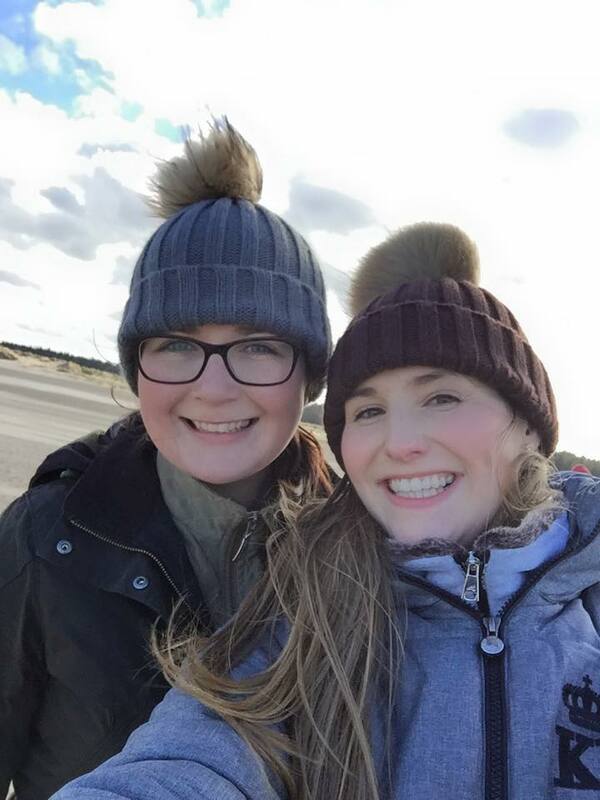 Met Office records show it was on average 3.8 degrees celcius higher than normal, proving to be the second warmest since records began in 1772 - love a geeky weather fact. As November progressed the warmth remained but the sunshine turned to cloud and rain, and I doubt I am alone in saying I have been longing for a crisp Autumnal morning when our fields sparkle like a harvest of diamonds in the sunshine. And did I get more than I bargained for on Saturday morning when I woke up to SNOW! Thankfully, it was only a sprinkling and the UK didn't grind to a halt but each day since for me, the world has glittered, meaning my Prince's bottom warmer finally came out to play. Almost twelve months ago I wrote a Wish List...I have been fortunate enough to tick two things off of it during 2015, one being a Thermatex Quarter Rug. 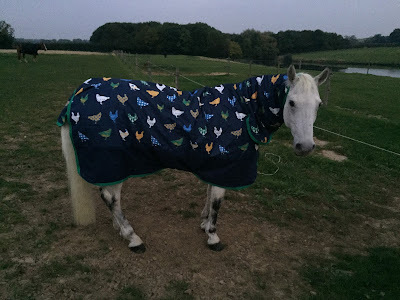 I already had a general fleece exercise sheet that is perfect for wearing on a hack, it is one of those that goes under my saddle flap, the only downside being when I have to remove it amid a schooling session...I have been mistaken for doing an around the world pony club movement, legs and velcro everywhere! 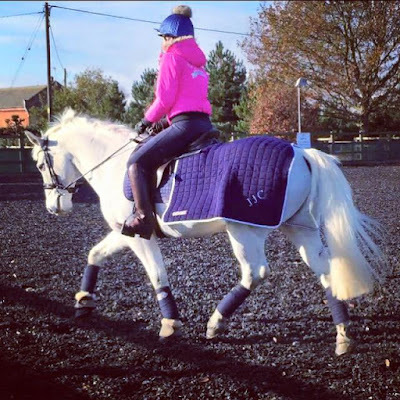 The Thermatex Quarter Rug takes away that inconvenience as it has two velcro tabs that attach to either the girth strap or the stirrup leather hole, whichever suits your saddle best, both are easily accessible when riding to simply whip off unaided. 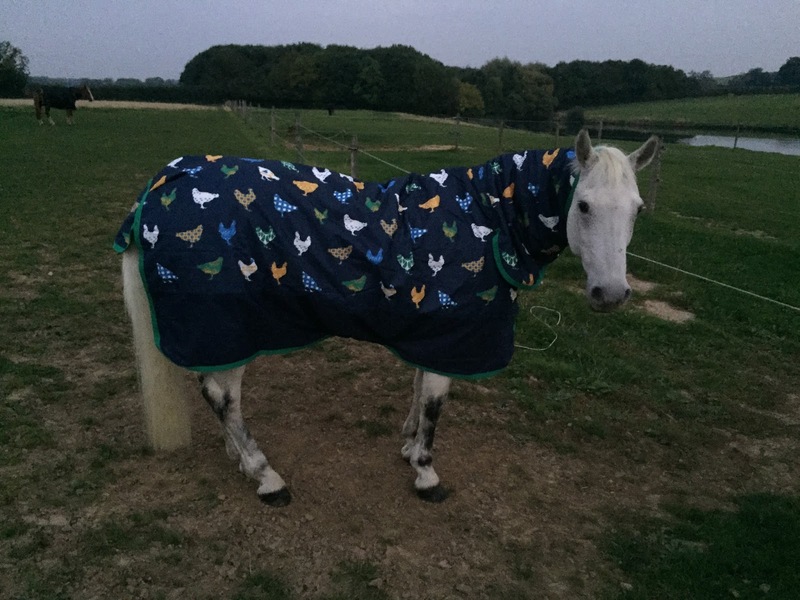 It is of course made from the quality Thermatex fabric, a high performance wool and acrylic blend to wick away moisture and insulate, each one is hand cut and you're able to choose from 22 colours, with several binding options and the additon of embroidery! If that doesn't excite you, I don't know what will! I chose a navy sheet, single binding in white and my initials JJC embroidered with an accompanying navy and white fillet string. 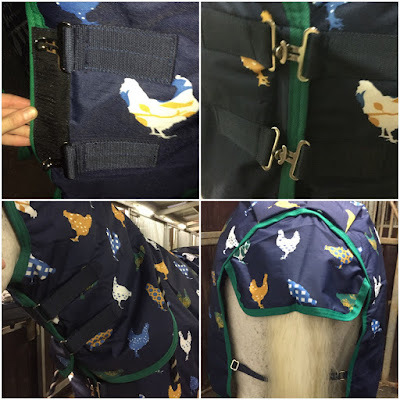 I am mesmerised by it, it is even more perfect than I imagined, super lightweight and keeps Oscar at the perfect temperature when I am warming up and cooling down, I can grab it myself off the gate without any fuss! The push that I needed came from Diamond Equestrian, in October they were kind enough to announce Oscar and I as brand ambassadors, giving me a huge sense of pride and a great excuse to share a little more about our journey, dreams and aspirations. I usually fill my personal Facebook with this, much to the bemusement of my "non-horsey" friends, so it also enables me to give them a break and diversify my blog, alongside my tried and tested I will be sharing news of our adventures and happiness, I'd love you to be part of it...please LIKE our page, Gee Gee and Me. 20th May 2013 I tweeted a picture of my feet, one foot was naked, the other sported an Ariat Bromont Tall H20 boot in brown...from this day forward they were on my wishlist and when I finally got my Ariat Bromont boots they were so beautiful I only wore them occasionally - to the odd show or lesson and once home they were quickly polished and packed away. I found my Ariat Bromont boots pinched the back of my knee slightly and decided to wear them when schooling at home to help make competition outings more comfortable, as the leather of the boots needed to drop slightly. All I wonder is what took me so long to make this decision...? My Ariat Bromonts are now all I ride in, they have all the superlatives of the Ariat Jodphur boot but give me such a secure feel, with less bulk than my boots and chaps. The Ariat Bromonts are hand crafted with Ariat's Waterproof Pro Construction, this features a waterproof membrane of full-grain leather and suede leather uppers finished with a stretch back panel and full length back zip system, water beads off the boots ensuring your feet stay comfortable and dry, riding most days in England, they've been waterproof tested on more occasions than I'd like, below are the boots today as I had to jump off to open a gate onto muddy ground, the only thing for it when I got back to the yard was to hose the sole, wetting some of the leather in turn, as you can see it rolls off without staining the leather and dries well, my feet remained dry throughout. 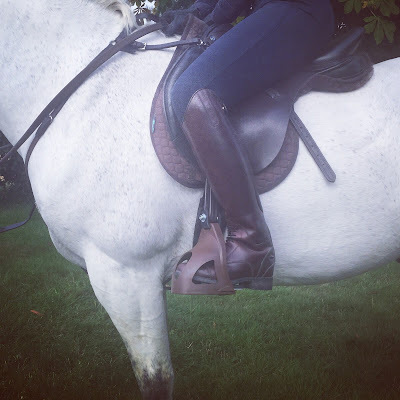 On the inner, Ariat Bromonts have a moisture wicking plaid lining - Ariat also offer an insulated version of the Bromont that sound dreamy for hunting and cold weather riding, however I wanted my Bromonts for year round riding without the risk of becoming overheated. As with all Ariat boots the sole is Duratread, a non-marking material providing superior grip and traction for safety around the yard. The Ariat Bromonts H20 cost £279.99 in brown or black leather and various feet, width, calf and height sizes. 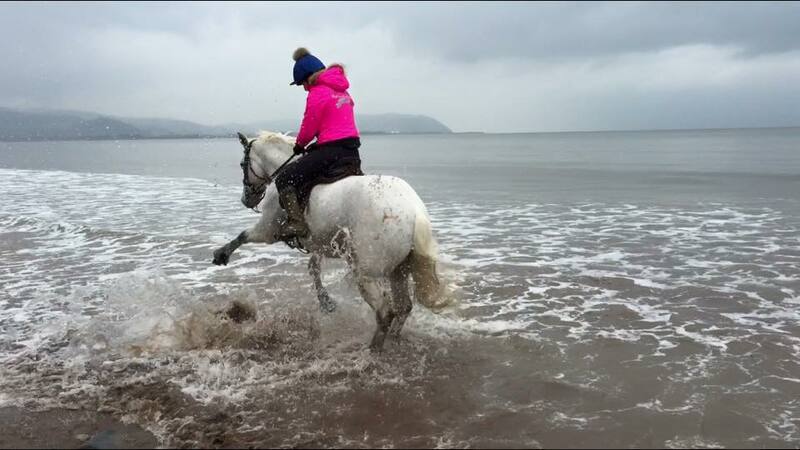 Oscar wears bridle and martingale from Evison Equine, numnah from Griffin Nuumed, over reach boots from Eskadron. 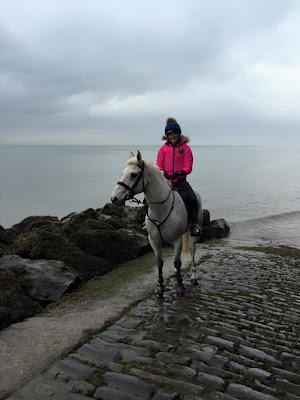 I wear wellies by Le Chameau, PINK La Valencio Eline jacket from Equissentials Dressage, Charles Owen hat with Amelia Jane London pompom silk - trusty waterproof trousers, unknown. 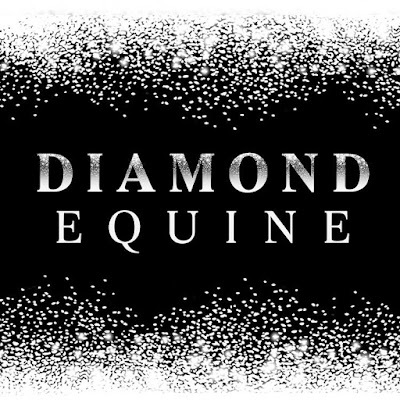 Diamond Equestrian is a small business ran by a fellow equine enthusiast, Evie, who is passionate about providing customers and our precious four legged friends with sparkly treasures! 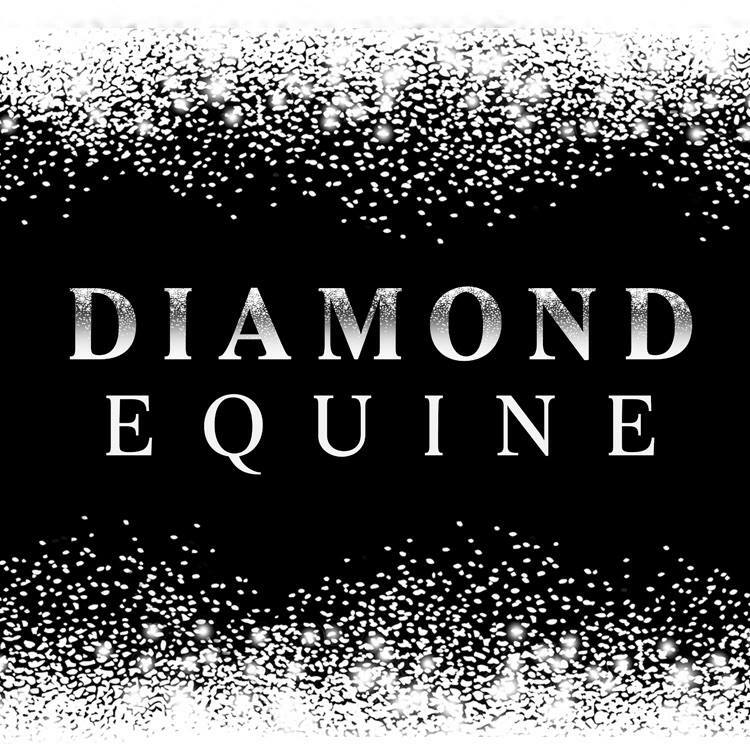 I am honoured to have been chosen by Evie of Diamond Equestrian, it is a huge compliment to be recognised, Oscar and I love SPARKLES and it seems this is the place to be for beautiful browbands! I love hacking and look forward to a thrilling exploration trip come the weekend, regularly going out for a couple of hours at a time, therefore it is a priority that Oscar is comfortable whether we're taking in the scenery at a leisurely pace or galloping across our beautiful countryside. 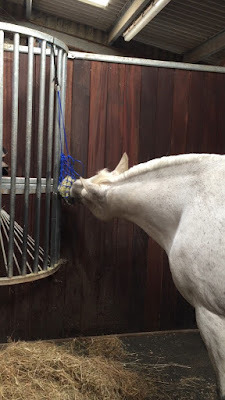 Griffin Nuumed ensure Oscar is exactly that and after resolving our saddle fitting woes early 2015 I haven't picked my grip pad up since - although it's safely stored in my tack room as it's been an invaluable piece of equipment that I or a friend may make use of again. And I fell upon a Griffin Nuumed Numnah totally by chance when discussing the saddle patch area of Oscar's Winter coat becoming dull and course, the hairs were brittle and starting to snap and not wanting the situation to get worse or cause discomfort/sores asking for ideas of what could prevent this...a friend immediately lent me her Half Wool Quilt Griffin Numnah. Photograph of numnah above were taken today, after clipping Oscar he has become a little scurfy from having rugs on 24/7 (as you can see) and tonight the numnah is home to be washed, the Griffin Wool can be washed in your machine using Nuumed liquid and they come up like new again, so simple and easy - even I've managed not to ruin it, success! 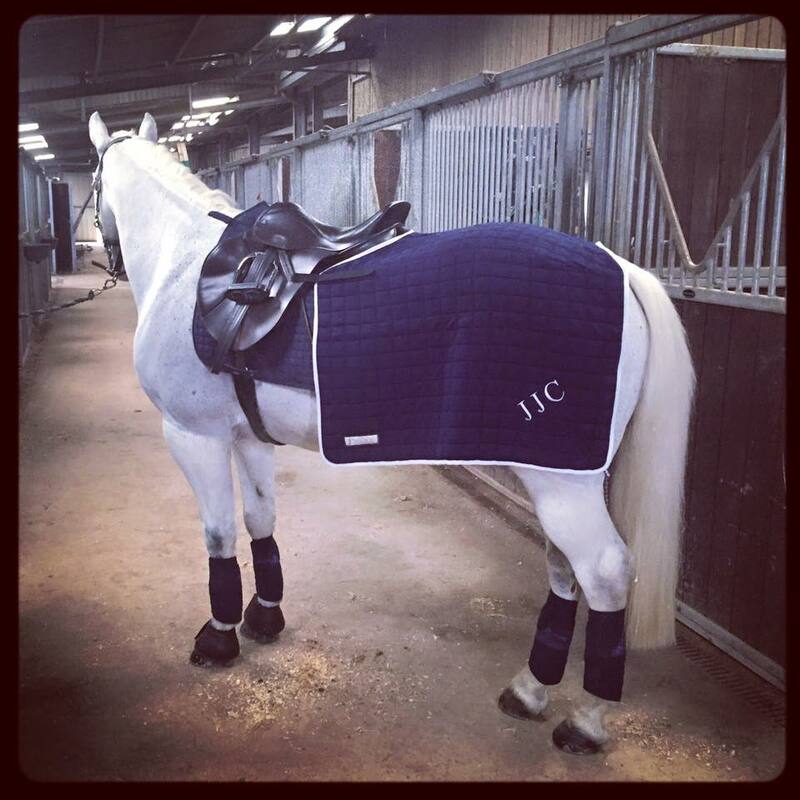 The Half Wool Quilt Griffin Numnah is conventionally shaped to fit your saddle, whether it be dressage, GP or jump/forward cut with a lightweight wool lining over key pressure points. I am cautious of anything with wool or lambskin because if they are too puffy my saddle won't fit, or it will slip...the joys of a round native, so the fact Griffin Nuumed knit their wool directly onto a cotton yarn creating a 5oz quilt it reduces bulk but still contains all the natural fibres required to ensure it absorbs up to 30% of it's own weight in moisture and reduces the likelihood of skin reactions or allergies. I am an advocate that Griffin Nuumed are true to their word, the patch of brittle hair on Oscar's back softened back down to silky, soft normality and no more rubs occurred using my friends Half Wool Quilt Griffin Numnah. 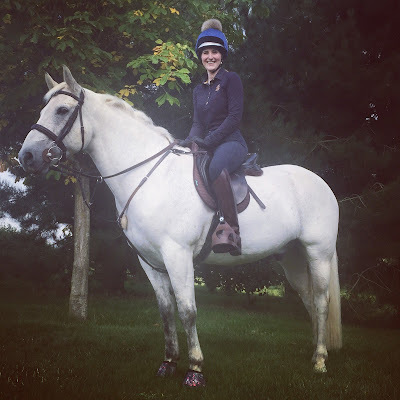 I soon purchased my own and have taken it on many sweaty rides this Summer and even today, in October we came back hot and damp but the saddle patch where the wool lays is always clean and dry, irritation free. Specialist sizing/saddles: Griffin Nuumed would be happy to discuss personal requirements via their made to measure service. Oscar and I have a 17" saddle and wear a Large and the fit is perfect, I would love to add the Original Wool Numnah from Griffin Nuumed to my collection too, it is fully wool lined and my half wool lined one can be wet beneath where the wool ends...now I know they work, one is on my wishlist. 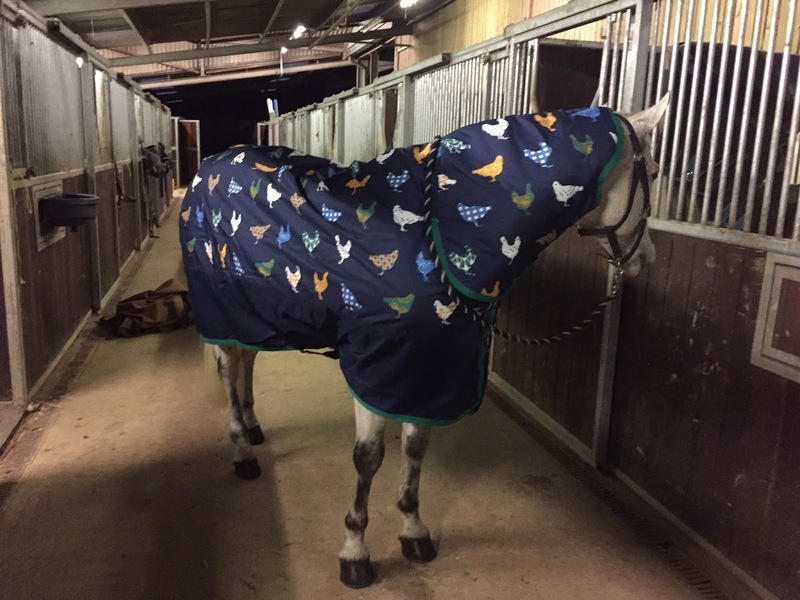 The rug is formally known as the Shires Tempest Original 200 Combo and has been lovingly renamed by it's super fans aka Oscar and I...who else - as THE CHICKEN RUG and we love it, it's so cool!! 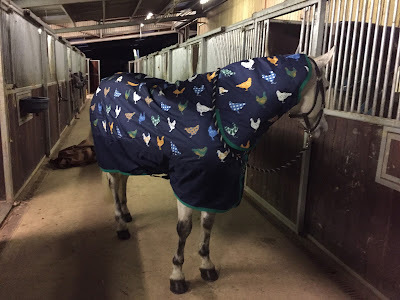 Those of you who have read the Gee Gee and Me post about the exact same Shires rug in 100g fill will understand why I highly rate the Tempest design, and if you haven't click on the link to take a look. They fit my Irish bog pony to perfection, they don't rub, they're breathable, waterproof - FACT, they actually are - the neck is a good length, the body is the perfect depth, they're strong, durable and super quick to whip on and off...leg straps you say? No need, easy! 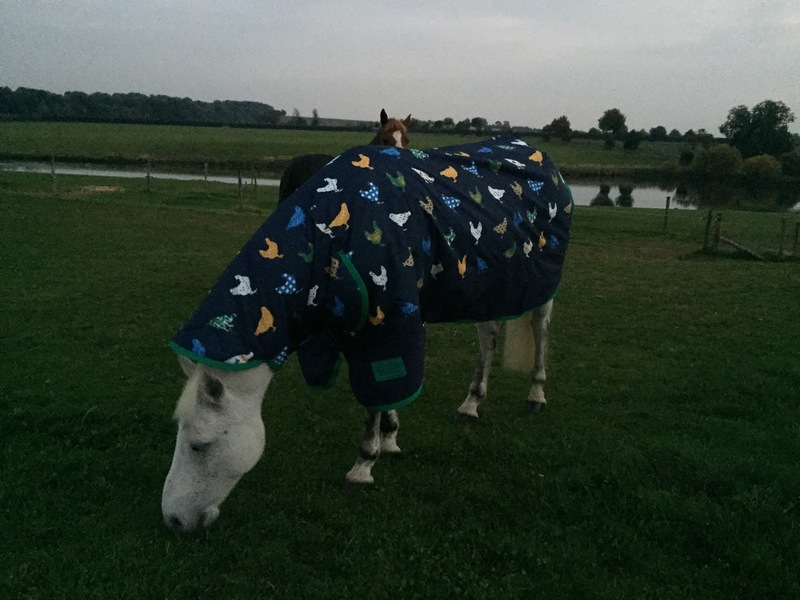 All of these superlatives and I haven't yet mentioned the incredible value for money the rug offers, it cost £61.99 and is perfect for night time turnout at the moment, Oscar is still living out and has been clipped so the 200g fill is perfect for the cool Autumn nights. Oscar doesn't eat hay in Summer, he turns his nose up at his haynet and refuses to eat it...I have given bales away thinking there is something not quite right about them, only for his neighbour to tuck in heartily without a second thought. This has led me to conclude he a) has a full tummy as he is turned out 24/7 or b) proving his importance to me by refusing to touch such dry fodder when he could be eating green green grass. As this behaviour is only during the Summer months I can cope with it, but on the odd day Oscar is stabled due to the heat, flies, farrier, being trailered longer than normal or when stood at a show - in-between/after classes it does concern me that his digestive system may not have the correct level of fibre required to fully function. And this is my exact reason for purchasing a Vitamunch from Equilibrium. 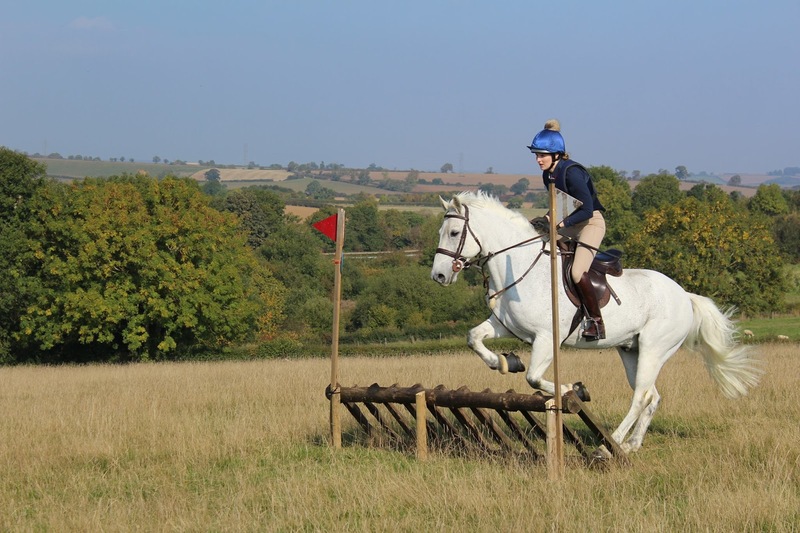 Equilibrium understand that horses are trickle feeders who naturally spend 75% of their time eating and Vitamunch provides a low calorie, high fibre, low sugar and cereal free snack suitable for all horses and ponies. Equilibrium take the quality of their products very seriously and state on their website that their own horses, all 15-20 of them guinea-pig product ideas before seeking wider approval, and where possible Equilibrium use human grade ingredients - they comment that their search for human consumption grade hay continues...but in the meantime source Timothy Grass slow dried at a low temperature to maintain a fresh and succulent flavour as well as nutrient levels. Each Vitamunch is enriched with essential vitamins and minerals and suitable for horses or ponies prone to laminitis or obesity and can be served wet or dry, hidden in the middle of a full hay-net or in it's own Munchnet, via a bucket, in a stable, a field or a horsebox/trailer (much smaller and easier to transport than hay...but I have to confess equally as messy). The mini Munchnets cost £2.95 and are purpose made for Vitamunch blocks, they come in four colours. You can see for yourself how much Oscar loved his Heavenly Hedgerow Vitamunch from the video below and I have already asked my local tack shop to consider stocking these as I think they're fabulous and can't wait to buy more...I think Marvellous Meadow next to remind us of the Summer months...and maybe a Flexi Munch once Oscar is stabled at night to help with any stiffness. I received an exciting e-mail early Summer 2015 from Etrical, offering me the incredible opportunity to put their safety stirrup through it's paces, I jumped at the offer and Etrical have been overwhelmingly supportive allowing me the whole Summer to use the stirrups in various equestrian disciplines to report back with an open, honest and comprehensive review of their safety stirrup. A simple structured one piece stirrup allowing free foot movement within the stirrup whilst preventing the foot from sliding too far forward and getting stuck - potentially very dangerous during a fall from a horse. The stirrups have a wide anti-slip footrest guaranteeing comfort whilst guiding the foot into the correct position and Etrical have a range of adaptors to fit their stirrup to any saddle/leather. 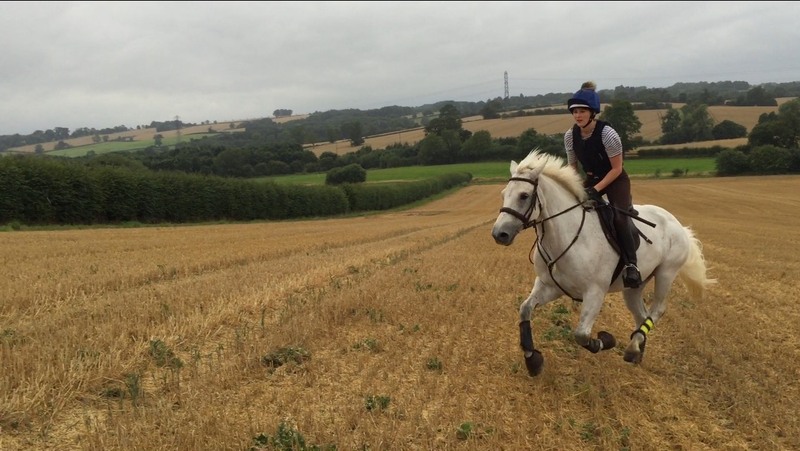 There are currently five designs, a style to suit every rider at any age, I chose to ride with the Randocal Endurance Openwork Stirrup, they're an extra strength stirrup, designed with long-rides in mind to suit our Summer hacking. When I opened the box I was surprised by the size and I thought they looked big, but they aren't at all, it just took me a moment to change my mindset from the coat hanger like piece of metal I am used to seeing, and once my booted foot was settled in the footrest the fit was perfect with the stirrup no longer felt big. Oscar also didn't noticed the size as they swung backwards and forwards when we walked to the mounting block, he didn't bat an eyelid. Once I had mounted...WOW, comfort, security, such relaxation in my lower leg and my seat altered slightly from the usual English straight back, shoulder, hip, heel style, what a pleasure they are to ride with! The tread on the stirrup is 13cm wide by 17cm deep and I leant something about myself I didn't know...my foot must move in my normal stirrups and I lift and lower my foot by habit to re-adjust my position maybe only lifting a few millimetres when I slightly loose my perfect foot position and I found myself doing it in the Etrical stirrups but it had no effect because my foot was so secure, I wasn't ever loosing or changing my foot position...but my body continued it's odd twitch for our first few rides?! Thankfully my foot...brain, began to trust the safety of the stirrup and I soon stopped this habit. This experience left me thinking how much confidence these stirrups would entrust into a novice or nervous rider the security they provide. The stirrups are feather light yet feel durable and unlikely to crack, they're safe enough to take a knock. They come in four cool colours, being my usual safe self I chose brown and think they look super smart. I have hacked, jumped, galloped and had fantastic fun using the Etrical stirrup this Summer, my favourite feature is their comfort, the wide base for my foot absorbed any shocks, relaxed my foot and reduced pressure in my ankles, not forgetting their incredible safety features, they're an "endurance style" stirrup that every rider can benefit from and enjoy. My next challenge for my Etrical stirrups...to use while perfecting my sitting trot! 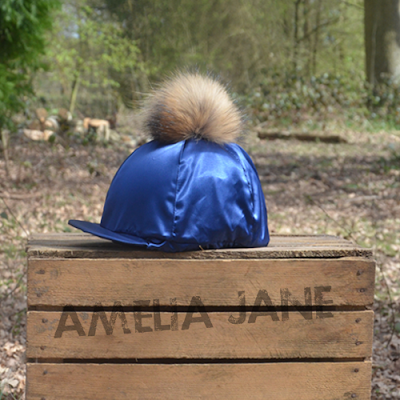 My choice was an Amelia Jane London navy hat silk with a fur pompom, it's the cutest! There are ten gorgeous hat silk colours to choose from and the pompoms are detachable. 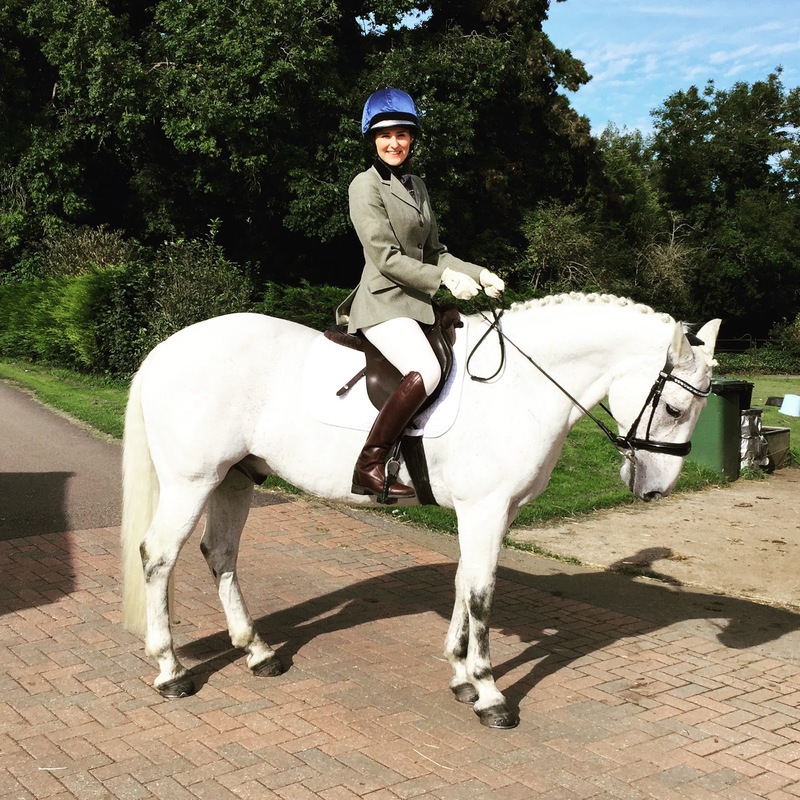 I chose navy for convenience as I use it for all disciplines - it even came to dressage with me on Sunday, just unpopping the pompom with no hassle of changing silks. The silks are cotton lined and due to my OCD nature I had to iron it before shaping it over my hat, the fit was perfect and true to size! I have also worn it in pouring rain and although my pompom resembled a pomeranian after a bath, it soon puffs up as good as new once it is dry! Amelia Jane London also sell these cool woolly PomPom hats too...perfect for this coming Winter - I love mine! 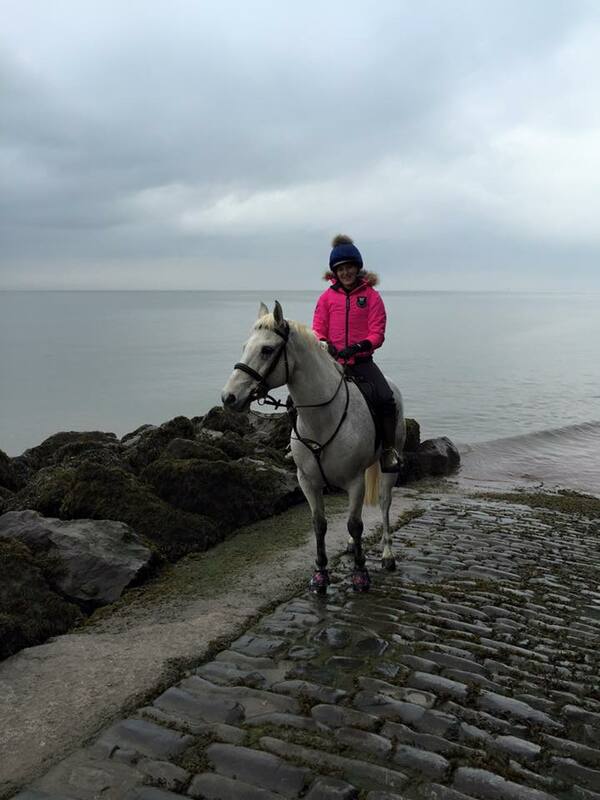 Due to transport it isn't often I get the opportunity to compete, however I couldn't resist the Lemieux ProSport Dressage Square in suede from their Luxury Dressage collection, I have owned it over a year now and I am proud to say it has had a handful of happy outings. I am always excited to pull it out of storage (as it's washed and wrapped away after each use) and it just feels gorgeous both on and off the horse. 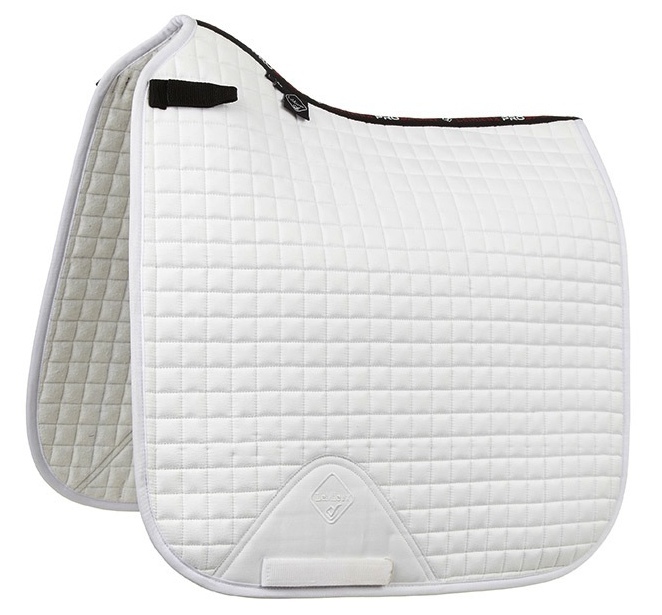 The ProSport Dressage Square in suede is beautifully soft to touch and in white it dazzles with a pearly sheen. 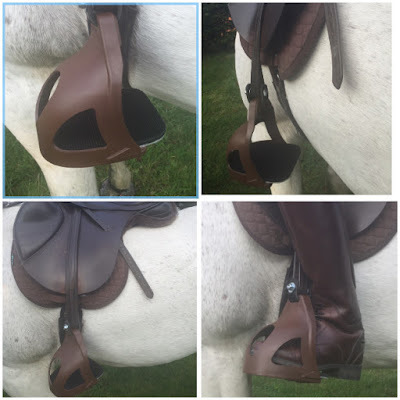 Horse Health describe the pad as having a dense feel, which is does, there is no fluffy padding and it moulds to the horse giving a close contact. The underside is a towelling flannel that absorbs sweat and minimises friction and again this is soft, Oscar has remained comfortable in it on some very warm days. 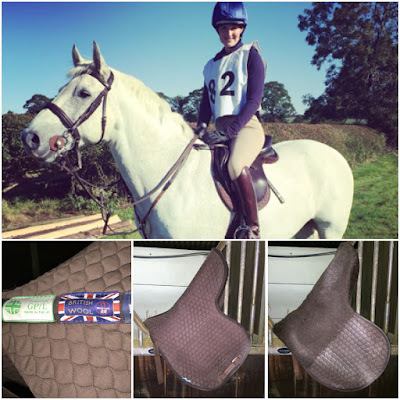 Being white, the pad comes home decorated with brown saddle, girth and boot marks, regular readers may remember I featured this pad on a blog some time back when I trialled a Pet Hair Wash Bag and epically failed, almost breaking our washing machine in the process!! Since that unfortunate experience I have continued washing my saddle pads and bandages in a tub trug in the garden and this pad responds brilliantly to that method, coming up as new after each wash, the only negative is it takes a long time to dry due to it's material - to those of you with horsey washing machines, I am envious. 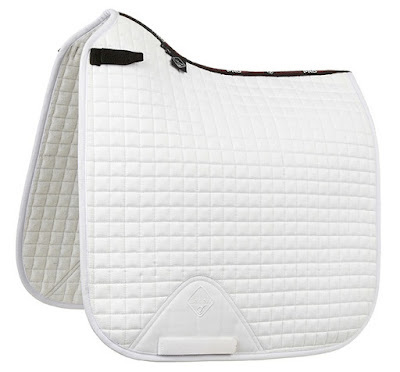 The Lemieux ProSport Dressage Square has velcro d-rings and a swan neck design for the perfect fit with the signature girth protection area and finally a hugely important factor for me, Lemieux's sensitivity rating for this pad is a one, suitable for sensitive skinned horses. 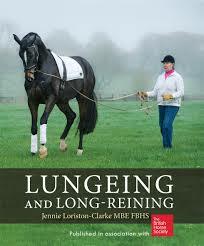 When my name was pulled out of the hat at Haynet HQ to review the newly published Lungeing and Long Reining Book by Jennie Loriston-Clarke; one of Britain's leading dressage riders and trainers I was over the moon. I love to learn and equestrian training books are something I treasure, I soak up the knowledge, make notes and poor Oscar is the guinea pig as I attempt to replicate the masters - a favourite technique of mine is to photocopy key pages/diagrams and take these to the yard with me as my notes - I'd hate to drop a book in the ménage or for it to be rained on so find photocopies useful to fold in and out my pocket for whenever I get stuck! 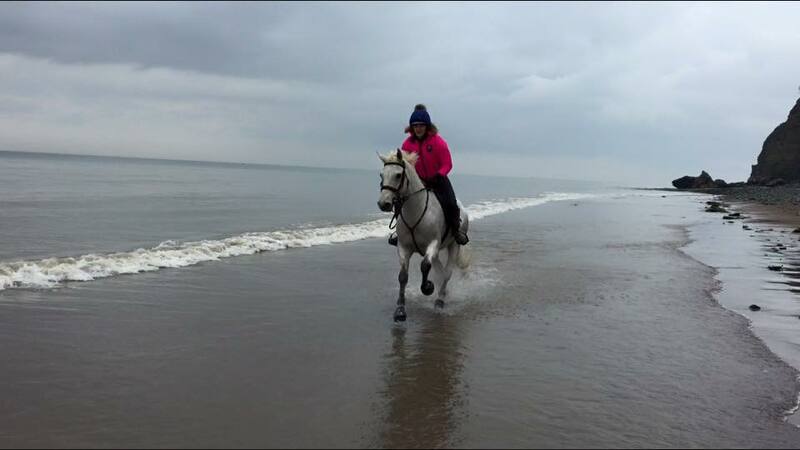 Finally, not to step on the lunge line or else I will trip and die...seriously someone actually said those words to me! 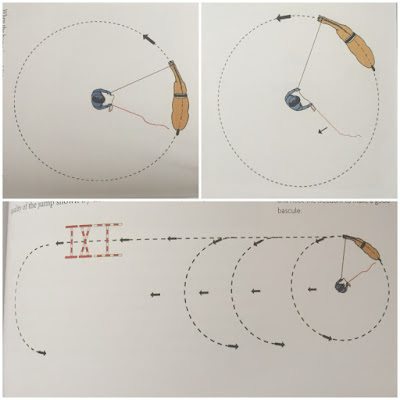 Advanced long reining - including cantering, rein-back, shoulder-in, travers, half pirouettes, half-pass, renvers, canter half-pass, canter pirouettes and tempi flying changes. 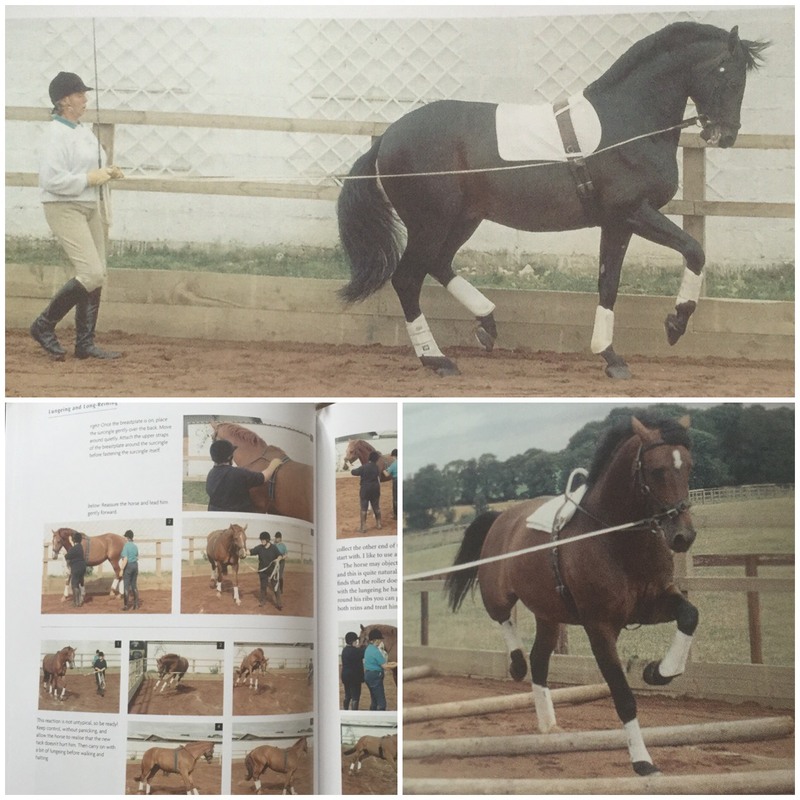 The book is a must read for anyone training a young and/or inexperienced horse, I wish I'd have known a lot of the safety techniques when re-schooling an ex-racehorse we had to stay last Summer - I hold a vivid memory of lungeing him on his weaker rein - his right, after racing left handed his whole career - and he just couldn't turn on the circle, whooshing me from one end of the 60m ménage to the other like a rag doll, not my finest moment but thankfully I had gloves on...oh and didn't let go! Since reading I have a deeper understanding of lungeing - why we do what we do- and feel more confident and effective in my training. 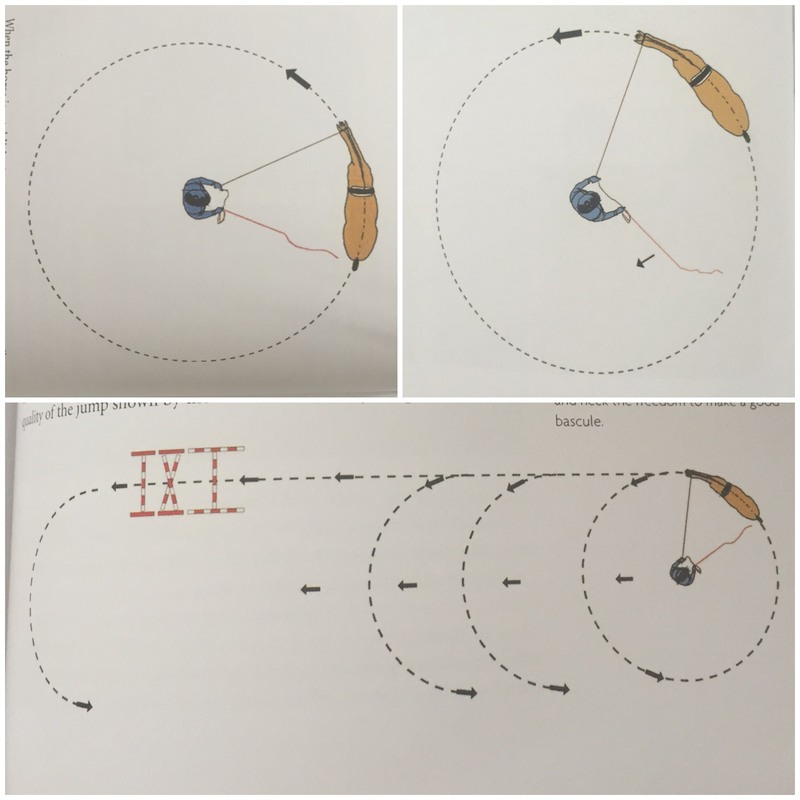 I have added a new string to my bow in the form of long reining...something I have only ever done once before and I am thoroughly enjoying playing with the technique in the safe confines of the school and as I gain experience I am looking forward to practising the more advanced moves to improve our suppleness. Lungeing and Long Reining expresses the importance of varied, fun and rewarding work for your equine partner and beautifully explains the correct foundations that if followed will reward you back in years to come as you successfully and accurately progress through the scales of training. A book I know will refer back to time and time again for years to come. 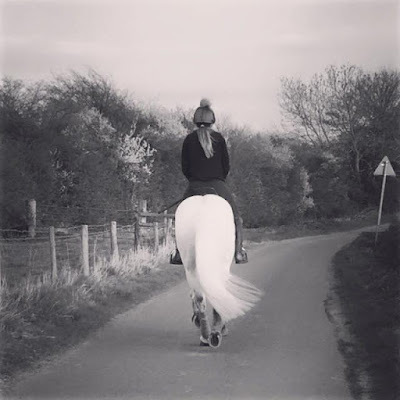 Ask yourself the question; what do I carry when I ride my horse out? My answer; my phone...possibly a tissue, totally depends on how many pockets I have on that day!? Not the most mature and sensible answer I could give, but it's an honest one. During the Summer months my phone lives down my breeches, I've known friends stash them in their bras but sadly I don't have a big enough cup size for an iPhone so my knickers have to make do! Now ask yourself...what should I take when I hack my horse out? My answer; PHONE...preferably with enough battery life, tissues, potentially some cash/debit card, a hoof pick, some bailer twine - in event of rein, bridle breakage! 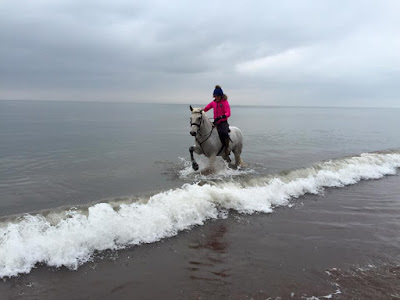 Horse treats and sugary human treats - please note my list isn't extensive, but it works for the hacks I ride of 10-15 miles - no picnics, torches, compasses or maps required! When I saw the FlipBelt I knew it would be perfect for equestrians, equally as it's current main stream market of fitness enthusiasts. FlipBelt's have no bulk or bounce to them therefore feel invisible, it is the comfortable solution to carrying all of your essentials. My FlipBelt is invisible under my body protector and I can't think of a better bounce test than galloping across Summer stubble fields! 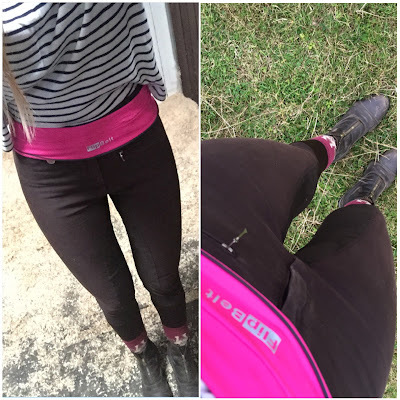 The FlipBelt can be worn where you find it most comfortable...many of you will liken this to getting the right pair of breeches, some of us like a high waist others a low rise. The pockets can be left facing outwards or for additional security the belt can be flipped inwards to keep the pocket sleeves close to your body, there is no right or wrong. Once you're happy and the FlipBelt is in place, it won't budge, I love this feature...I have trotted along roads and uneven terrain in my FlipBelt and it's true to it's word, it doesn't bounce or jangle around, I've also cantered out my seat and jumped it in and it is unnoticeable - gone are the days of handing my phone to my trainer, friend or leaving it at the side of the ménage, hoping for no rain, no falling off, no important phone calls and NO forgetting it after my ride! 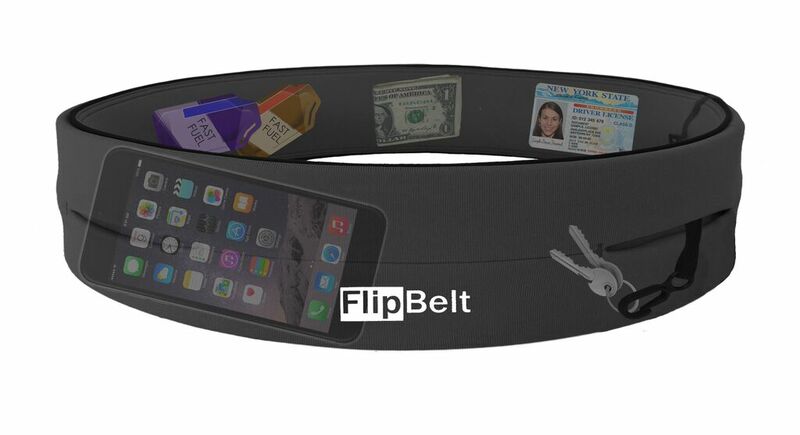 The FlipBelt is made from a wicking fabric to keep you comfortable, dry and chafe free - 92% polyester and 8% spandex, it is feather light and super stretchy with a small key clip inside one of the pockets for increased security. And when it gets stinky, it can easily be popped in the washing machine on a cold cycle. FlipBelt's size guide is superb and can be found here - I wear small - I am a high waisted girl (can't have my back catching a chill can I...) and therefore wear my FlipBelt quite high around my waist. 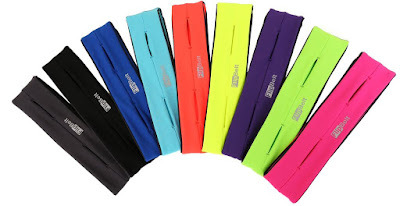 Now for the fun part...FlipBelt's come in nine wonderfully cool colours, I chose Hot Pink...partly for road safety, I wanted something bright and my hiviz is pink and secondly...because it's PINK! I absolutely love my FlipBelt it holds my hoof pick, bailer twine, keys, cash, phone, tissues and treats, all my essentials weightlessly and comfortably, I also think come Winter it will be ideal for the Hunting season, I am always short of secure pocket space and forever concious of bulking out my tweed too much, lumps and bumps are never flattering, the FlipBelt makes these invisible.